The “Greatest Generation,” those who lived through both the Great Depression and World War II, are dwindling in number and I fear there are many lessons they wanted to teach us that we refused to learn before it became too late. Boomers and Xers and Gen Y became too comfortable believing they would never see that kind of strife again and forgot how to do things as a society (and I’m using broad brush strokes–so please, don’t send me angry mail.) We don’t sew (although the knitting trend is cool) we barely cook, we don’t grow or raise food. Only a few know how to build a house or to fix even the simplest machines. Everything we want is either at our fingertips or a two-day wait from Amazon. We love Pinterest for all the great recycling of old stuff ideas, but how many of us actually are DOING something instead of just pinning the idea under a title that might as well read “cool stuff that I will never do because I am too crazy busy in my crazy busy life”? I used to be a teacher. Now, I work part-time at a low wage job where my children can come with me and I don’t pay for daycare. And when I’m not at work, I can be home with them while they are little. Besides that, I’d be paying exorbitant rates for daycare if I was back to work full time before my kiddos are in school, anyway. What I’m trying to say is I understand being on a budget. So, besides coupon cutting, one of the ways I can save cash is by taking to heart the old adage, “Waste not, want not.” The Greatest Generation did this all the time and we would be wise to take a page from their books. They were reducing reusing and recycling long before it was the “in thing” to do. I remember visiting my paternal grandparents’ home on Kibby Road in Jackson, MI and learning from them about being frugal and living off the land. They would save their coffee cans and use them for all kinds of containers. They saved jars that could be re-used for canning. They had neatly organized little drawers with bits of string,rubber bands, paraffin and other random items. You don’t need to buy rubber bands. Save them off other things in a little bag or drawer! Straight nails and screws and nuts and bolts and yarn and just about anything can be re-used. They had a big garden and some fruit trees and nut trees and Grandpa hunted in the woods behind the house. Grandma taught me a little about wild mushrooms. Why would you pay a high price for food if you can get it for a little work instead? Most of us like to think we’re in the position where gardening would cost more than it would save. But, if you plan ahead, gardening can be a real money saver! Start your seeds ahead of time under a sunlamp in the early spring instead of paying ridiculous prices for starter plants at the nursery or hardware store. Can tomatoes. Dehydrate the skins and make tomato powder from them. Save seeds for next year. Pull weeds. It builds muscles and character. Be outside. Grandma always stayed trim and never went to a gym! Learn to eat “weeds”. There is so much nutrition in the plants we overlook all the time. Grandma sewed us dresses and did all her own alterations and mending. Have you ever paid for alterations? OH MY GOSH! Didn’t you wish you could do that? Buy a book or take a class on sewing and pick up an old sewing machine at a garage sale or on craigslist for cheap. You will thank me. I’ve learned how to take in my husband’s shirts since he lost weight. That’s saving me $20-30 PER SHIRT on alterations alone. Learn to darn socks. Yes, socks. I know it sounds so old-fashioned, and it is, but it only takes a few minutes. Use an old Edison-style light bulb, stick in it your sock, and sew up the hole. Just try it. You’ll get it right eventually. And when you do, you’ll be saving yourself $6 a pair instead of going out and buying new socks. I know. $6 is not a lot of money. You can afford it. I can afford it. No big deal, but the sense of accomplishment is great and it’s a perfect place to start if you’re new at sewing. And, while we’re on good places to start, sew on your own buttons for Heaven’s sake! You do not need to be an expert tailor here. Just put thread into a needle, tie off one end and start sewing back and forth through the buttonholes. It takes less than five minutes. Save hiring a seamstress for the big jobs. And save the buttons off your old clothes that can’t be salvaged or donated. My elderly neighbor had a button box full of buttons that I found fascinating and beautiful as a young girl. If you don’t end up using them for clothes, use them for crafts and scrap booking. And for crying out loud, use scraps for scrap booking, not overpriced pieces of paper from a craft store. That’s why they call it SCRAP BOOKING! What would you like to learn to do on your own? I can host classes or post YouTube videos if you are interested. Easy, delicious, fresh, low-carb, seasonal, amazing! I make this recipe straight from the garden. The kids love it! slowly brown sausage in large frying pan, set aside. Slice onion thinly and saute over medium-low heat in 2-3 T lard or oil. If you have enough fat in the pan from frying the sausage, just use that instead. If using mushrooms, add them about 5-10 minutes after starting the onions. When onions are transparent, but not yet beginning to caramelize, add zucchini. Stir it occasionally. When water is boiling, drop in the tomatoes for about one minute, then remove them, cut off the tops and slip the skins off. Run the tomatoes in the food processor to puree them. You may have to do this in 2-3 batches to avoid making a mess. Add pressed or minced garlic, salt, pepper and oregano to the tomatoes. By this time, the zucchini and onions should be softened. Add the tomato sauce and continue to cook until it’s the consistency you like. Then, put the sausage back in for about 5 minutes until heated through. *Look for non-GMO zucchini in the store. Better yet, grow your own. It’s a pretty easy crop. And for that matter, grow your own garlic and tomatoes. Nothing beats fresh tomatoes from your own garden. Both of my grandmothers grew lots of vegetables in their gardens. Working in your garden saves you money, gives you good exercise and fresh air and sunshine. Eating locally and fresh is one of the healthiest things you can do for your body. It doesn’t get any fresher or more local than your own garden! 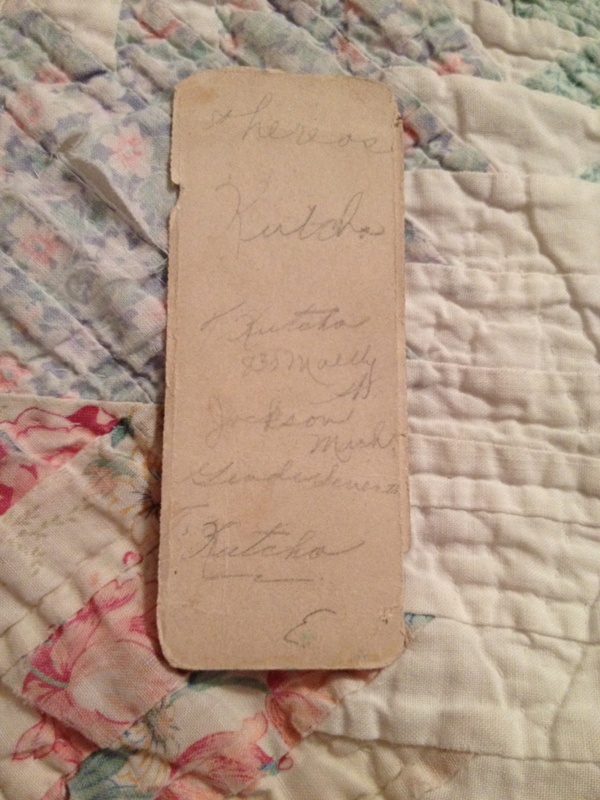 The back of the bookmark Grandma received in 7th grade. How do we remember those who have gone before us? When I was just a little girl of about four years old, after Grandma had said my prayers with me and tucked me in to bed on the couch with the plastic bags over the cushions “just in case”, I tiptoed back into her room. I wanted a glass of water, or some such thing to prolong the going-to-bed process. There she was, kneeling down by her bed and praying. 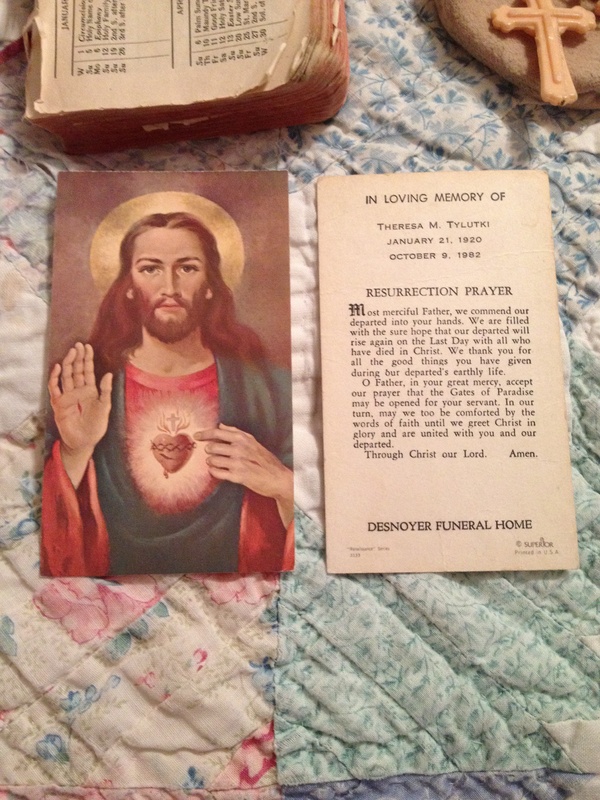 In front of her, she had a prayer book, a rosary, and many of the prayer cards one receives at funerals. 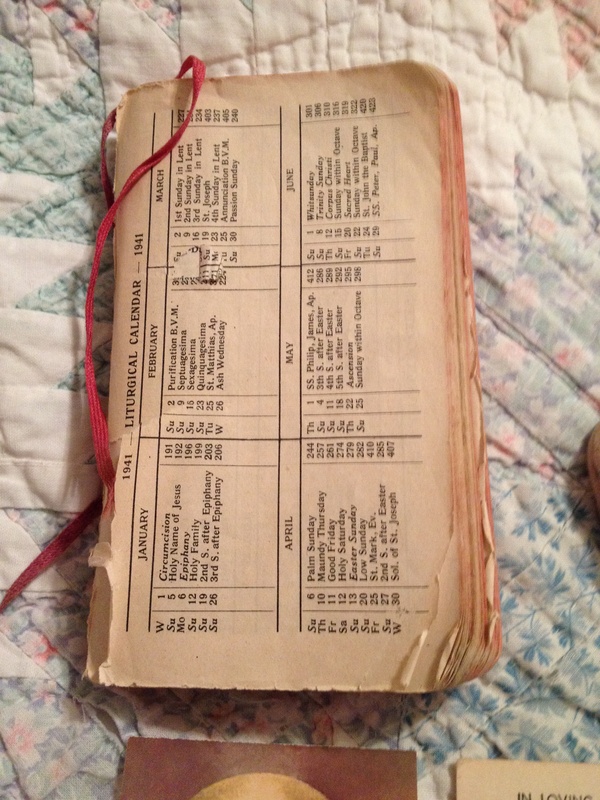 By four years old, I had learned to say the “Our Father” and “Bless us O Lord and these thy gifts…” the prayer we said before dinner most nights at our house. I didn’t understand how she could, or why she would pray so long and for so many people. I was much too young to have a theological conversation about praying for souls in purgatory, or whatever it was that she was praying about, but I never forgot the image of her there, on her knees, with all those prayer cards laid out on the bed. Sometimes, after Mass on Sundays or holidays, Grandma and my parents and I and some of my aunts and uncles and cousins would go to St. John’s Cemetery and put flowers or a wreath or a “blanket” on family members’ graves. I didn’t know any of those people. My first experience with losing a loved one would be losing Grandma the October when I was four years old. But I learned by watching the actions of Grandma and Mom and Dad and my aunts and uncles, that remembering someone who has died, is an important thing to do. I remember thinking that 15 years was so many years ago and I wondered why, after all those years, it would still matter. I didn’t say so. I knew that if it was important to Grandma, it must be important. Now, almost 32 years after her death and on the 13 year anniversary of 9/11/01, I realize how very insignificant time is when it comes to dulling the pain of a great loss. In the Catholic Church, believers pray for “Eternal Rest.” In the Orthodox Church, when someone dies, the faithful chant, “Memory Eternal.” To me, these are very special and important prayers for us, and about those who have gone before us. We should remember them in our words and our actions so that the lessons they taught us and the love they gave us will never die. 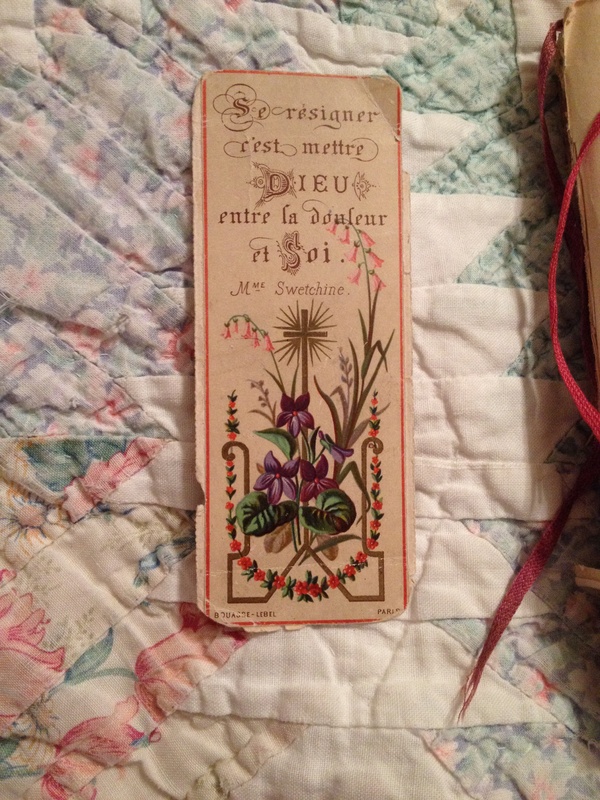 I am lucky enough to have inherited Grandma Tylutki’s very worn prayer book and many of those remembrance cards. They are an important reminder of how love goes on, long after someone has died. It is my hope that my children will learn to memorialize loved ones by my actions as I learned from my elders. Today’s post was going to be a recipe…but as I sat down to write, I decided another zucchini recipe could wait and this could not. Downtoearthangel.com is all about taking the best of the past for the present, and the clothesline is quite under-appreciated by too many people. So, I thought perhaps I would remind my readers about this blast from the past. I love my clothesline because it gives my clothes a smell that Downy just can’t replicate: a sweet mixture of grassy notes, hints of flowers, trees and sunshine (don’t tell me sunshine doesn’t smell). Even with dryer sheets, the dryer makes them smell, well, boring. Clotheslines make clothes look almost ironed…even if I leave them out longer than I need to. I do not have time to keep checking the dryer to see if the clothes are just at the right amount of damp-dry to shake them and put them on hangers to avoid the ironing board. Most of the time, I’ll put in a load and not get back to it until it has cooled down and set all the wrinkles in quite permanently. Who has time to iron? Not I! Yuck. But I also don’t like sending my brood out looking like they just rolled out of bed. Solution: clothesline. UV light naturally kills germs. Did I mention I have four small children? Enough said. Sorting clothes from the dryer is kind of a pain. We have six people in our family and having a folding table big enough to properly sort clothes as I fold them is a challenge. With my clothesline, I play a little game where I run around and take down and fold all of one kind of clothing for one child and then proceed to the next. That way, I don’t have Johnny’s underwear mixed in with his shirts. They’re all nice and neat and organized making them easy to put away. Fabulous. It actually saves me time. Dryers emit positive ions. It sounds good, but it’s actually bad. Positive ions make you feel yucky and depressed. Ever walked into a laundromat and felt better than being outside? Nope. I didn’t think so. “Sunshine on my shoulders makes me happy.” Don’t take my word for it, ask John Denver. Oh wait, he died. Well, anyway, we have it on RECORD. OMG I’m so punny. p.s. To my dryer, I’m sorry for picking on you. But you have to admit, you kind of had it coming–if for nothing else–then at least for creating black holes that swallow the children’s socks. However, I like the way you dry the towels and make them fluffy. A young friend of mine wrote this on her blog http://www.ellieshack.wordpress.com and It contains so much wisdom of the ages that I just have to re-post it for you all to read. If you’re reading any media aimed at teenagers, what is one piece of advice that is sure to be squished in somewhere? “Be yourself.” This seems like pretty solid advice, but the problem is that at this age of maturity, nobody knows what being his or herself even is. I certainly don’t. We have slivers of ideas of what ourselves are, some contradicting themselves, some short-lived, some spot-on. How is “be yourself” good advice? Certainly “be yourself” assumes that I am somebody. But I know that there’s sadness you’re hiding inside. I’ll always be her for you. You think you’re protecting me when you go inside you. When you hide from me, I am weeping for you. In Grandma’s day, too often, people hid depression, bi-polar, and other mental illness the best they could. Many today still do. But one thing that I learned from Grandma is that loyalty is prized in a friend and love is the strongest force on Earth. This song is dedicated to my friends who have ever felt alone, who have struggled with depression, anxiety, mental illness, shame or guilt or anything that they felt they had to hold inside. I’m here for you. I’ll be your listening ear, your shoulder to lean on, cry on, or your hand to hold. Because you are my friend and I am your friend and I will always love you. This song may be shared ONLY on this original blog page unless specific, authentic permission is granted in writing by the author.